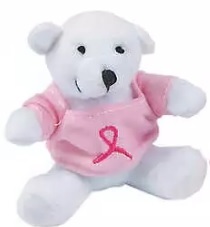 The Pink Ribbon Breast Cancer Awareness Teddy Bear is a cute, plush teddy bear in a sitting position. It is a great way to support our breast cancer awareness efforts. It will make a nice, cuddly gift for breast cancer patients and survivors as well as young family members. The Breast Cancer Awareness Bear is white with a pink ribbon on its light pink shirt. The Teddy Bear is approximately four (4) inches high.